Now that the nights are becoming longer and summer is around the corner I’m getting the taste for fresh flavours over the hearty winter meals I’ve had so many of. So here is the first of many, my pan fried salmon & mediterranean veg. The veg is roasted and served with quinoa/salad. I absolutely love mediterranean vegetables after they have been cooked to perfection in the oven. There is a fair amount of chopping to do but aside from that you can chuck it all in a roasting dish, splash with olive oil and just leave it in the oven until it’s done. I always make med veg when we have summer barbeques, as you can prep ahead of time then just decant into a big bowl for everyone to help themselves to. It beats the lonely bowl of cherry tomatoes you often see.. But alas, we are not quite in barbeque season yet. To be frank, most of the time it doesn’t even feel very spring like with the grey skies and rain, but we’ll get there eventually. So the accompanying salmon was cooked in a pan. I like salmon to be crispy and favour the grill or pan over the oven. I use a non-stick pan so you can put the salmon straight in without the need for any extra greasing. The fish is naturally oily and will be fine on it’s own. This is a great mid-week meal, healthy, filling and often there’s leftover veggies you can add to your lunch for the next day. Plus the salmon and quinoa are high in protein, so perfect after a work out also. Although do be aware there is some prep work with the chopping so it isn’t the quickest meal. Worth the effort though! You could always use ready cooked salmon and microwave quinoa to save time, although my recipe includes the steps to make these. Keep it simple, do what suits you and enjoy! 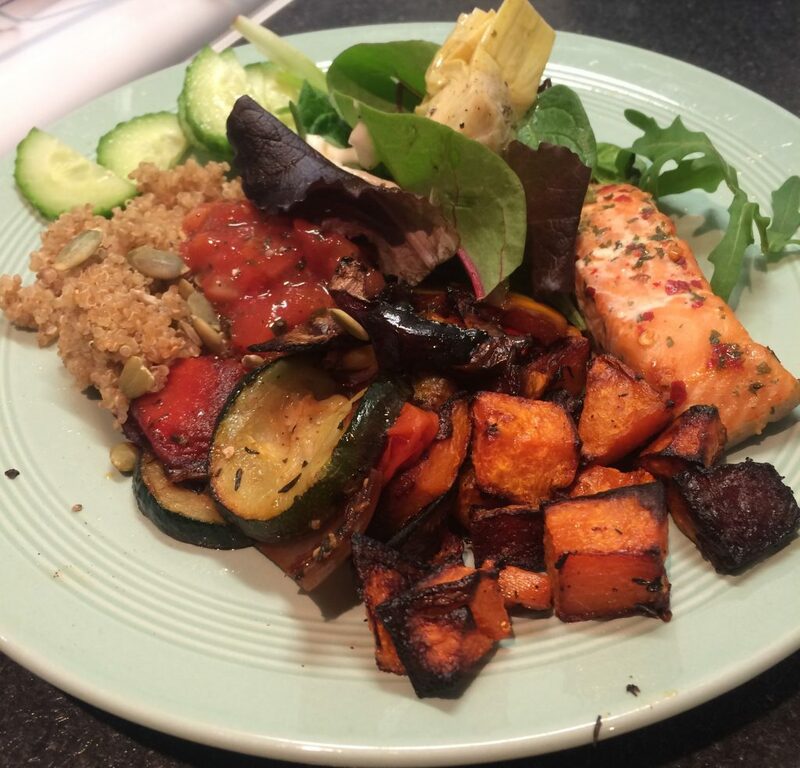 A healthy, protein rich dinner of pan fried salmon with delicious roast mediterannean vegetables. Served with pumkpin seed quinoa and salad. We'll start with the mediterreanen vegetables. Pre-heat your oven to 200 degrees / 180 fan and set aside a large roasting tray. Wash all your vegetables and chop into chunks, aside from the red onion which can be cut into wedges and the cherry tomatoes which can be left whole. Chuck all the prepared vegetables into the roasting tray and drizzle over 1tbsp of olive oil. Sprinkle on the mixed herbs and garlic salt. Season with salt and pepper to taste. Put the tray onto the middle shelf of a pre-heated oven for 30-35 minutes, until the vegetables are cooked and becoming crispy. Turn half way through cooking. Once you have put the vegetables in the oven it is time to start the quinoa. Rinse the quinoa under a running tap of cold water for a few minutes and set aside. Put the two cups of water into a pan and bring to a boil, crumbling in the vegetable stock cube. Once bubbling away add the quinoa. Leave the pot of quinoa to bubble away on high for a few minutes, stir and then turn the heat down to medium-low. Put the lid on the pot and leave alone for 15 minutes. Once cooked the quinoa should have absorbed all the liquid. Leave the pot to stand with the lid on for 5 minutes or until ready to serve as this will keep it piping hot. Before serving mix in the pumpkin seeds. Crush the garlic and stir this in also. This is the easy part. Use a non-stick pan and you won't require any additional oil. Heat the pan on a medium-high setting. Whilst the pan reaches the desired temperature season both sides of the salmon fillets with salt and pepper. When the pan is hot add the two fillets of salmon, skin side down. Once the salmon begins to cook it will release it's own oils. Cook on one side until the skin starts becoming crisp (4-5 minutes) then flip onto the other side. Continue to cook until the salmon is done in the middle. You can cut it in half to check. Prepare two plates with a leafy side salad. Add any extras you desire (I used cucumber, artichoke and a dash of salsa). 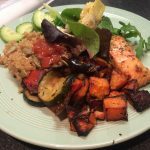 Arrange a generous portion of the mediterreanean veg, a fist sized portion of the quinoa, spinkle some pumpkin seeds on top and finally the salmon fillet. Now you're ready to dig in! For heat lovers, you can change up the seasoning for the mediterreanean veg by adding chilli powder. I also added chilli flakes to my salmon for a little extra kick. This dish is made extra lovely with a fresh salad dressing or salsa. 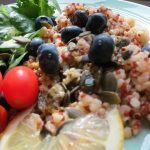 This lemon & blueberry quinoa salad is versatile, vegan and drizzled with flavoursome lemon dressing! 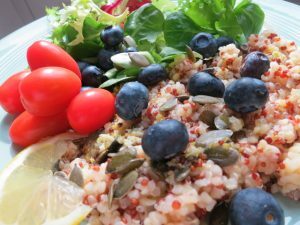 Back when I did my stint at veganism this lemon & blueberry quinoa was my go-to salad. 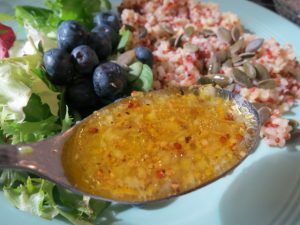 It has a lovely fresh flavour from the home made lemon dressing which pairs up beautifully with the blueberries. Serve with mixed leaves and a sprinkle of crunchy pumpkin seeds for a balanced and tasty lunch. This simple salad doesn’t have too many ingredients, which is a bonus as there is less prep time, yet it still is bursting with quality fresh ingredients and flavours. Enough to convince you? You can make this ahead to bring to work with you, or eat it straight away if time allows. This recipe doesn’t take long to put together, the longest part is waiting for the quinoa to cook. I’m so sold on the lemon dressing that I think next time rather than making just enough for two salads, I’ll make a batch so I can use it on everything. A fresh salad, flavoured with zingy lemon dressing and topped with crunchy pumpkin seeds. Oh, and vegan too! To make the quinoa heat up 1.5 cups of water in a pan. Rinse the quinoa and add to the boiling water, reduce to a simmer and cover. Cook for 15 minutes, then take off the heat and leave to stand, still covered, for 10 minutes. Whilst the quinoa is on the go, prepare the lemon dressing. In a bowl mix together the lemon juice, lemon zest, garlic, olive oil, agave & mustard. Add salt and pepper to taste. 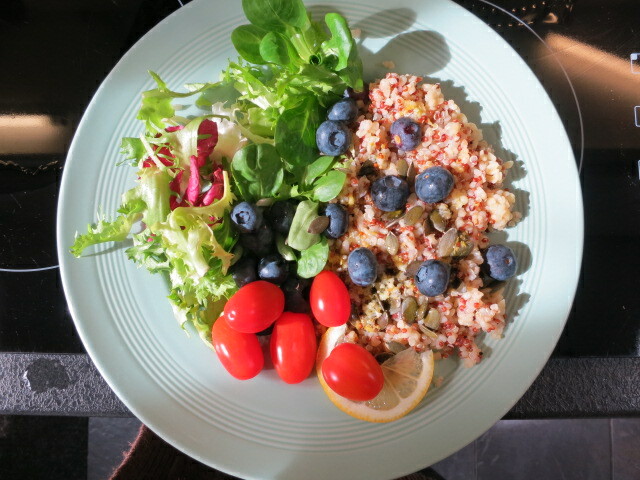 Once the quinoa is ready, divide into two portions and plate up. Time to assemble the rest of the salad. Add the blueberries and pumpkin seeds. 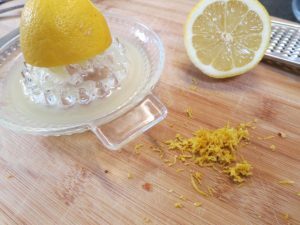 Drizzle on the lemon dressing. To finish it off serve with some fresh salad leaves and baby plum tomatoes. If there is one thing that makes cooking easier it is simplicity. This is so quick to throw together and it just shows that it’s not about complicated ingredients and flavours, it’s about pairing those that taste best. Hope you enjoy! milk, or if not a dollop of greek yoghurt makes a good addition and thickens it up too. 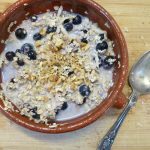 This recipe is one of my favourite weekday breakfasts, as the name suggests, you do have to make the effort to prep it the night before. But it’s so worth it when you, sleepy-eyed in the morning, make your way over to the fridge and remember breakfast is sat there waiting for you! You can heat it up if you like but I tend to just take it out the fridge and leave it on the side to get to room temp for a little while before tucking in. This flavour combination is one I made up when I had a glut of apples and they were starting to go a bit soft and wrinkly, still good and flavoursome but not the sort you can crunch into as a snack. I peel and shred them into the mix, so if you have kids that are shy of eating their 5-a-day you can try this method to sneak in some fruit without them even noticing. My boyfriend is guilty of avoiding fruit but he always counts himself in when I offer to make overnight oats. This recipe is full of fruit and goodness, plus the sprinkling of walnuts adds in some all important protein which will keep you going until your lunch. 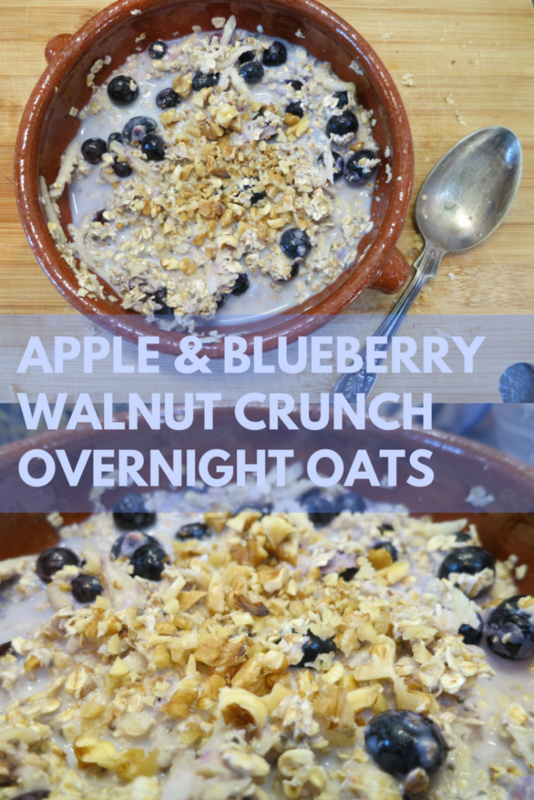 Fruity oats with a crunchy walnut topping, make ahead and enjoy for a tasty, hassle-free, breakfast. 1) Wash, peel and shred the apple, place the shredded apple into a bowl (you can make the mixture up in one large bowl and divide it into two at the end, or split all it into two bowls to start with). 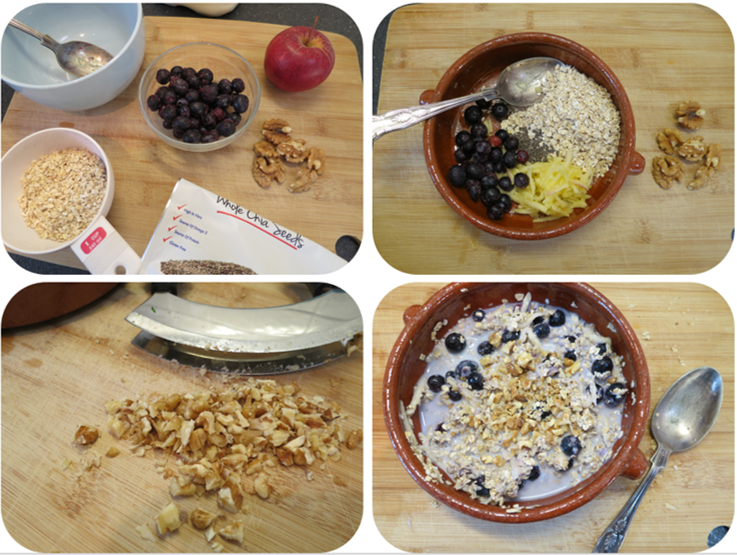 2) Add in the oats to the bowl, then the chia seeds and the milk. Give the ingredients a good stir and make sure they are all combined. Split into two serving bowls. 3) Gently mix in the blueberries, I use frozen blueberries but use fresh if you prefer. 4) Chop the walnuts and sprinkle over the top. 5) Cover the bowls and leave in the fridge overnight. Leave the bowls out of the fridge for 30 mins before serving, or warm through in the microwave. Add more milk in if the oats have absorbed everything up and sweeten with honey or maple syrup. When Christmas is finally over, all the presents have been given out, the cheese selection in the fridge devoured and the fizzy wine popped, what is always left? Chocolate. Let’s face it, it’s the perfect gift to give to anyone and everyone. Colleagues at work you don’t really like that much? Chocolate. The cleaner? Chocolate. That distant auntie you only ever see at Christmas? Chocolate. Everyone likes chocolate, and it’s inexpensive, which is a great help! So in my lounge is a huge bowl choc full (excuse the pun!) of Cadburys roses, Reeces peanut butter cups, Lindt truffles..and no matter how many after dinner cups of tea and an ‘oh go on then only one’ moments I have..the supply doesn’t seem to reduce! But you can’t just throw away good chocolate..so I’ve cobbled together this lovely recipe that will end that stash and produce something even tastier. Which is also freezable, so you can chuck it at the bottom of the chest freezer and dig it out as an when, normally once the post Christmas buldge has had a chance to reduce. Chocolate brownies. Oh yes! These brownies are really sweet and fudgey, perfect with a hot drink as a treat once in a while. 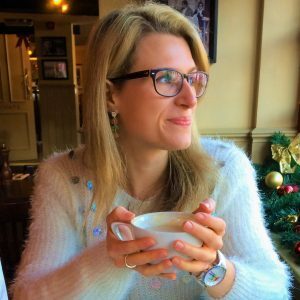 Usually I use rich dark chocolate in brownies but with this recipe it didn’t really allow (depends on what chocolate you have left over!) but it was still lovely. The more refined milk chocolate type leftovers you have, the less sugar you should need to add, so just chop and change as necessary – you can’t really go wrong. Mix all the ingredients together until fully combined. Pour mixture into a prepared brownie pan (or if you are ill-prepared like me, use an oven dish that’s too big and use parchment paper to try and fashion a smaller vessel!) A pan of around 8×8 inches should be perfect, any bigger and the brownies will be a little thin. Bake in the preheated oven for around 30-35 minutes, test the centre with a toothpick to ensure there is no wet batter left before removing from the oven. A really nice treat to have a hot brownie, knowing that it’s used all the leftover milk tray that I would have no doubt grazed on for weeks. Perfect to share with friends or if you’re really feeling sick of all the festive indulgence, put these heavenly slices in the freezer individually wrapped in cling film and bring out whenever you are most in need. Fingers crossed you’ll have most of the ingredients you need without having to pop to the shops – I know I had most of the list in my kitchen cupboards, a bonus is not needing any eggs or butter with this one, just an inexpensive tub of greek yoghurt works wonders.